How would you like to create an environment where your employees think of themselves as the company? Where they understand brand and brand equity and how they can impact it? Where they are valued as an equal and respected for their thoughts and ideas? An environment that creates success? Once you have an environment where your people care about you, you have created a place where they show up at work believing in themselves and truly caring about your company. You have created a place where they succeed. You have created a place where your company succeeds. No matter where you are with the development of your book, Cathy’s coaching can provide value to helping you achieve your goal. 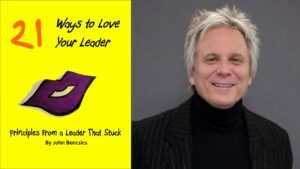 To order 21 Ways to Love Your Leader click here.